I always feel like I have to give you the story ... LOL! I'm still in St.Lucia, winding down my time here. So yesterday I sat in a bar with my family when I allowed my BB to rudely interrupt. LOL! I got this Facebook update from Kybecca Wine Bar & Shop. Explore your favorite wine variety. Get to know a new retailer. Wherever you travel, drink local. After relocating to Virginia, last summer, Kybecca Wine Bar & Shop group popped up on my Facebook. Immediately I joined, though not much of a wine drinker (love whiskey and tequila! ), it kinda looked like my sort of place! Also I thought the restaurant was only minutes away from my home but soon realized that it was between 1 to 2 hours away. Not long after, once again in November, I vowed that Kybecca might be the ideal spot for my birthday celebration. I posted my desire to visit for my birthday on their Facebook page. Next thing, a young man commented and said "it would be the perfect place to celebrate a birthday!" ... now Paul is another random friend of mine on Facebook! ... And I'm yet to visit Kybecca, 'cause for my birthday I ended up in Thailand! The pictures below lead me to another story about my relationship with wine. 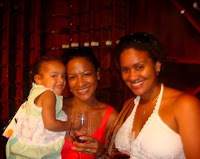 My girl, Che and I went to a wine tasting class last summer and here we are in the wine cellar. Later that night we agreed to test our new skills and went out to a bar and had a few more glasses of wine. 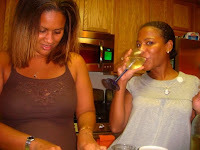 In October, when she came to visit me in Virginia, we were at it again ... drinking wine!